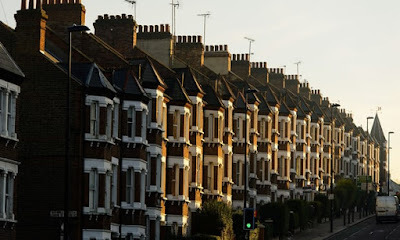 UK house prices fell in March for the second month in a row, with London again the weakest region, according to Nationwide, one of Britain’s biggest mortgage lenders. The average price of a home was £211,625 last month, down 0.2% from the previous month. In February, values fell 0.4%. The annual rate of growth in March slowed to 2.1% from 2.2%, marking the joint lowest rate since June 2013. Robert Gardner, the Nationwide chief economist, pointed to the continued squeeze on incomes, despite a modest pickup in wage growth. “Consumer confidence has remained subdued, due to the ongoing squeeze on household finances as wage growth continues to lag behind increases in the cost of living,” he said. Northern Ireland led house price growth in the first quarter with a 7.9% annual increase, although prices there are still the furthest below their pre-crisis levels – 38% below 2007 – while overall UK prices are 16% above. Wales also saw house price growth pickup, from 3.3% to a 6.1% annual rate, while Scotland was little changed. 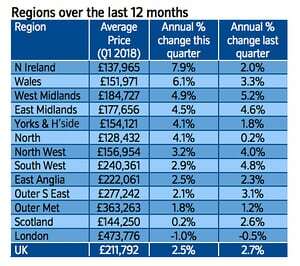 The West Midlands, the region with the strongest growth last year, was the fastest-growing among the English regions, with prices up 4.9% year-on-year. For the fourth quarter in a row, areas in the north of England recorded stronger annual house price growth than those in the south, where rates are now the slowest since 2012. In London prices were down 1% compared with a year ago. As a result, the north-south divide has narrowed slightly, although values in the north of England are on average still less than half of those in the south. A typical house in the north costs £163,138, compared with £331,047 in the south. Nationwide expects house prices to rise about 1% this year, with unemployment and mortgage interest rates still low, along with the lack of properties on the market, likely to provide some support for house prices. Samuel Tombs, the chief UK economist at Pantheon Macroeconomics, reckons prices will flatline this year, strengthening the case for just one Bank of England rate rise in 2018. He said Nationwide’s figures provided “more evidence that even the relatively modest increase in mortgage rates seen over the last six months has hit the market hard”. Tombs also said record high loan-to-income ratios meant that homebuyers will have to put a much larger share of their incomes towards loan payments.